We are glad you visited us to find this selection quotes on gratitude. The Josephson Institute is a nonprofit organization devoted to increasing the ethical quality of individual and personal decision making. I hope you’ll browse our other entries and subscribe to our What Will Matter blog at www.whatwillmatter.com (it’s free) and/or our What Will Matter Facebook https://www.facebook.com/WhatWillMatter?ref=hl. I think you will find lots of things you like. As a pre-Thanksgiving bonus, we’ve collected Michael Josephson’s best original quotes on gratitude. We hope you will share your favorites. 1) Gratitude is a feeling not statement. It is so easy to say we are grateful that I often don’t stop to really, really take the time to experience gratitude. Saying the words doesn’t mean a thing without the feeling and it takes a moment of genuine reflection to summon that feeling. This Thanksgiving don’t shortchange yourself with hollow words. 2) Gratitude should be felt and experienced sincerely, expressed generously and received graciously. 3) The best way to show true gratitude for all our blessings is to be genuinely happy. 4) Our obligation to others and a gift to ourselves is to acknowledge and authentically express genuine appreciation for courtesies, caring and concern others have given us. 5) It is not enough that we express our gratitude, we must experience it. 6) Try the gratitude diet – start your day by writing down one different thing you have to be grateful for and write a thank you note at least once a week. 7) Discipline yourself to start each day identifying something to be grateful about. The world opens to those who approach it with a grateful heart. 8) Expressed gratitude encourages further giving; ingratitude drains vitality out of the spirit of generosity. 9) Gratefulness is a payment everyone can afford. 10) Gratitude is not a payment for a kindness but another form of gift. 11) It is easier to be grateful for the things we have than to the people who have helped us get them. 12) You can either be miserable dwelling on the troubles you have or grateful for the ones you don’t have. Your troubles don’t care but it makes a huge difference in your life. 13) Never do anything for another with the expectation of gratitude. The expectation itself turns the gift into an exchange and suggests a debt is owed you. 14) When was the last time you wrote a thank you note? 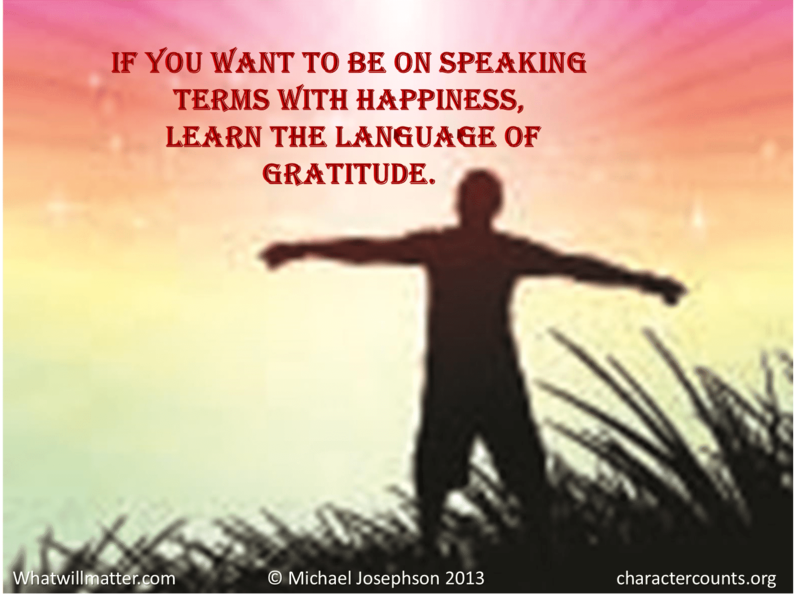 When was the last time you went beyond a mechanical “thank you” to express authentic gratitude? We can enrich the lives of others and ourselves by making it a habit to express genuine appreciation for what others have done for us. 15) At home, be grateful. At work, be appreciative. Gratitude is a gift we give ourselves. Appreciation is a gift we give to others. Digging a little deeper . . .
16) One problem with gratitude is that it competes with the sense of pride, self-reliance and accomplishment we have. We want to think what we have is the result of our efforts rather than the gifts, good turns and opportunities provided us by others. 17) Gratitude is most treasured when it is unexpected. When we expect, even demand gratitude, we treat it simply as payment due for some service we rendered and we squeeze any good feeling out of it. 18) For many of us gratitude to others comes with a sense of debt that can never be fully paid and therefore the things we are thankful for are never really ours. 19) Authentic gratitude is much more rare and precious than expressions of gratitude which are often empty courtesies or simply tactical ploys to encourage further gifts or kindnesses. Request information you have about your quotes. 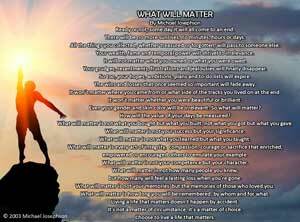 Hi Alfreda, Thanks for visiting the What Will Matter website. Please let us know what information you’re looking for and we’ll be happy to assist!